Making fennel salad at home in Italy, August 2016. This tip is from Julia Child and it goes to anything: baking, cooking, making a salad. 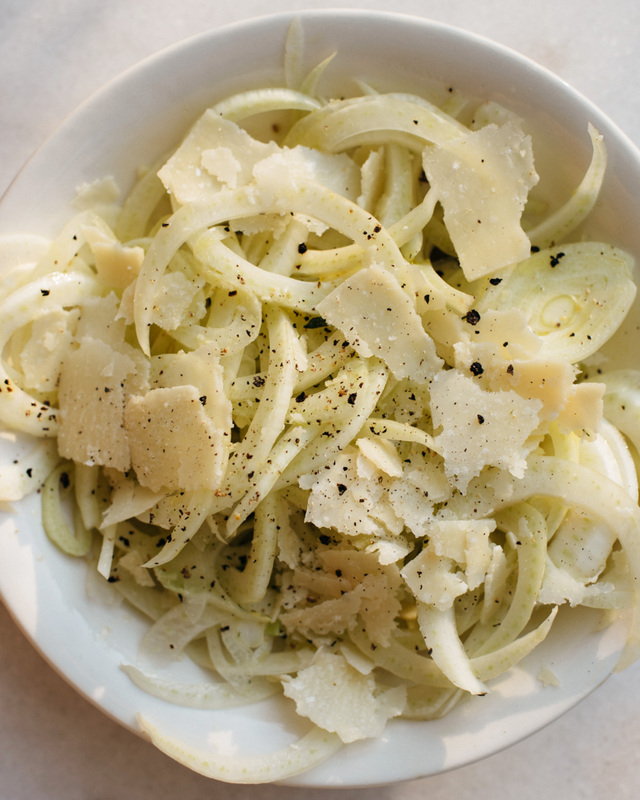 One of my favorite salads is one with fennel, lemon and parmigiano. I remember the first time I had it in Italy. Never before had I known fennel that had so much taste in it, even though it was combined with strong flavors like lemon and aged cheese. The recipe is from Saku’s book Basta! but I will share it here because even if you had the book on your hands browsing it you want to make so many different things that you forget the poor salad (that still remains one of the best salads in the world). Cut two fennel bulbs into thin slices lengthwise and lay them on a serving dish. Add the juice of one lemon and an equal amount of good olive oil. Add rough slices of good parmigiano. Season with salt and pepper, and mix. Let marinate in a refrigerator for about an hour. Before serving, add a little more cheese and black pepper on top. Goes well with bread and antipasti – or as a side dish for chicken, meat or vegetables.